Imagine picking up a Nintendo DS and playing games in 3D without the clunky, dork-tastic glasses. 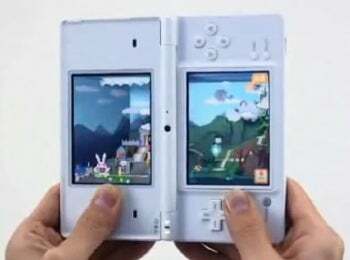 Nintendo says a handheld gaming device that'll do just that will launch in Japan before the end of March 2011, and that it'll reveal its so-called "Nintendo 3DS" to the world for the first time at E3 2010 this summer. But wait--3D without the funky eyewear? How does that work? Like those tricky picture perception puzzles, where you have to "relax" your eyes to see the mathematically embedded 3D picture? Or like the laser heads-up-displays that project an imagine onto your retina? Or how about actual head jacks, like the metal prongs plunged through occipital bones in The Matrix? Nintendo hasn't identified the technology yet, but maybe you saw this link in late February referring to a Nintendo DSi Ware game that uses the DSi's camera and a sophisticated face tracking algorithm for glasses-free 3D. The amazing part: It works with existing DSi hardware--no special screen overlays or lasers or steely brainpan-popping spikes. That's one possible glasses-free method, and as you can see by watching the YouTube demonstration above, the 3D effect translates so persuasively you can even see it watching a standard video clip. Another approach involves projecting an LCD image through a panel fitted over the display screen. But early attempts using this method required you remain stationary and in a fixed position. Not exactly family (or buddy) viewing friendly. An improved version of the latter approach recently demoed at CeBit works around this limitation by projecting the 3D image to as many as 64 viewing positions. A variation on this method projects to a single point in space and uses a camera to follow you around. Perhaps the most impressive "camera-based" riff at CeBit involved using multiple cameras in a display screen that tracked the position of a viewer's eyes and signaled the plate in front of the screen to move in tandem. Speculation aside, let's assume Nintendo's got the 3D part down pat, and that it'll be at least as persuasive as the technology in the video above. The real question's this: Will gamers buy a so-called "Nintendo 3DS" on the merits of 3D alone? Ask that question in a broader sense, "Is anyone really interested in 3D?" and the answer's "No one knows." The technology's all hype and punditry to date, a public relations push by technology vendors eager to sell pricey versions of existing view-screen technology with a slight visual twist. No one's really teased out 3D's aesthetic value. So far, it's just another effect laid over fast-moving images to add literal depth to something your brain already interpolates as three-dimensional. And that's thinking about it in a "received" sense, i.e. watching movies or TV shows. If you're going to make it part of a proper gaming device, you almost have to come up with a gameplay-specific reason for it to exist. Nintendo's 3DS already has one foot in the "just an effect" camp. In its 3DS launch memo, the company said its "Nintendo DS series" successor would include backward compatibility for both Nintendo DS and DSi titles. Those games won't play any differently, they'll just have "literal" visual depth overlaid. So no, I'm not convinced people want a 3D Nintendo DS. Not if that's all it does. Not unless Nintendo's bringing more than 3D to the party. They're Nintendo, after all. Their premium console's beating the pants off the competition, and it can't even do high-definition graphics. They've built their reputation on gameplay first, in other words, and visual trickery last.